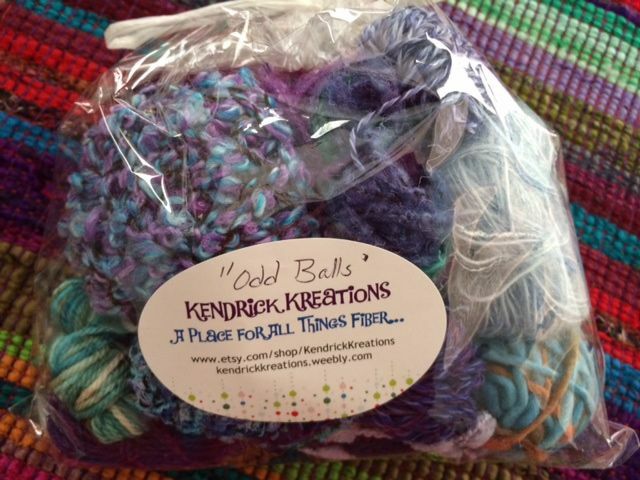 "Odd Balls" and pre-wound warps -- need to update this page for what's actually in stock. 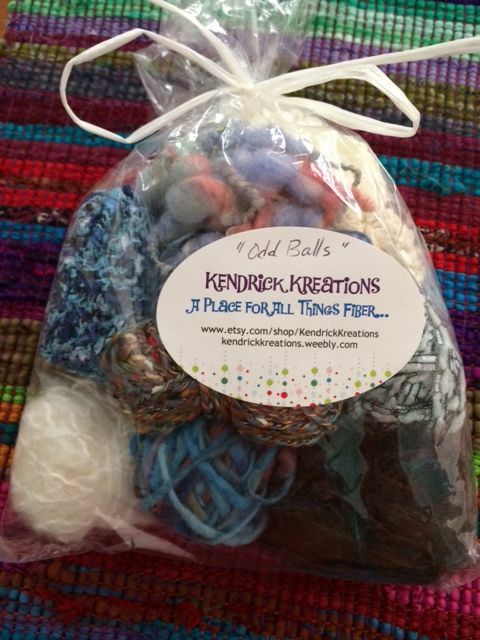 Each package of "Odd Balls" weighs in at approximately 3 oz., is made up of various coordinating yarns, and can contain some or all of the following: cotton, rayon, silk, wool, poly. 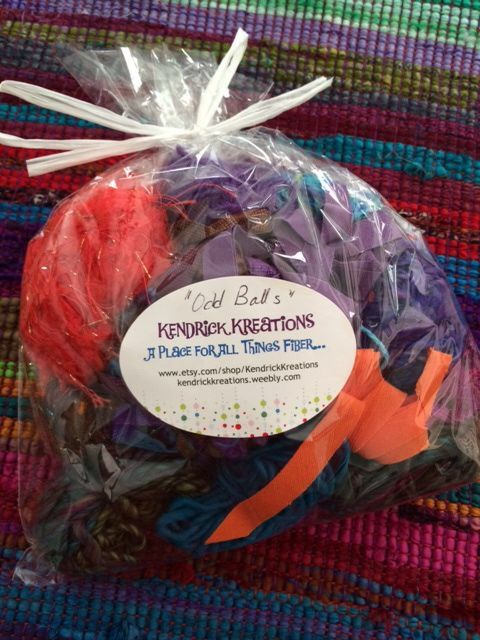 The price per package is $11.95 plus shipping. Photos are of the front and back of the package so you can see what is contained, more or less. 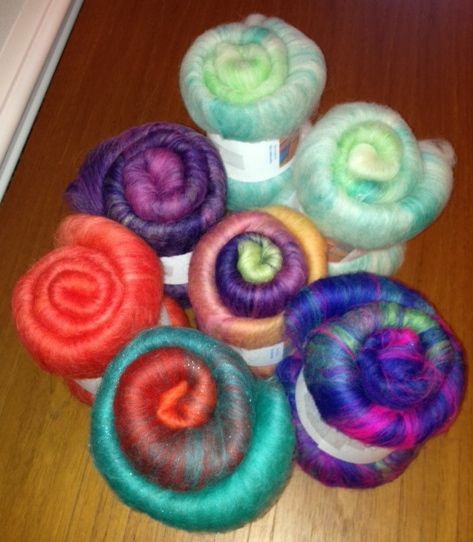 "Odd Balls" OBPu12 $11.95 plus shipping. 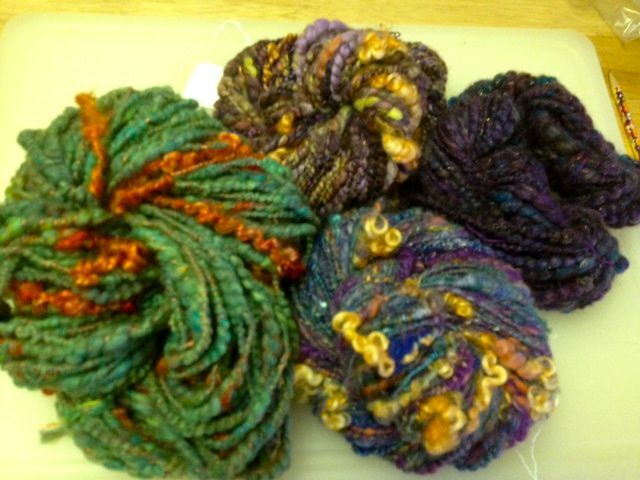 "Odd Balls" OBBe12 $11.95 plus shipping. 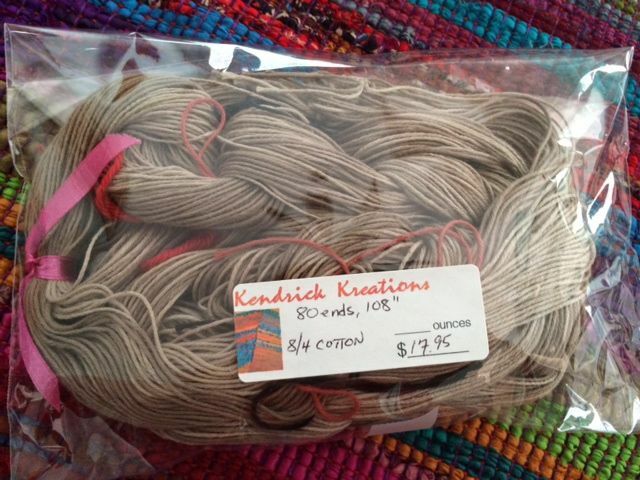 Pre-wound warp, 80 ends, 108" each, 8/4 cotton. $17.95 plus shipping. SOLD. "Odd Balls" OBPu34 $11.95 plus shipping. SOLD. 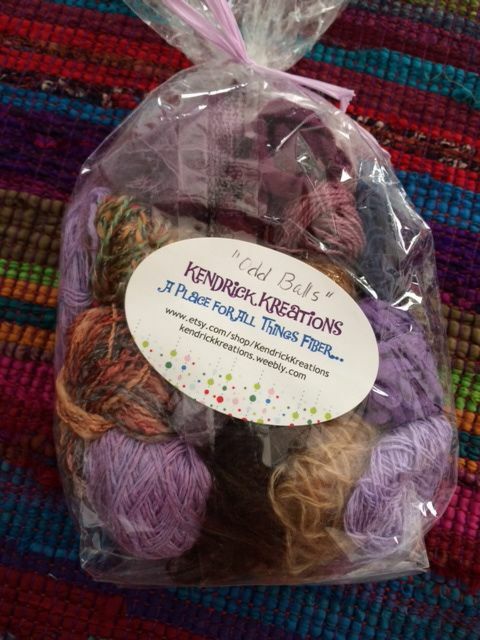 "Odd Balls" OBPu56 $11.95 plus shipping. 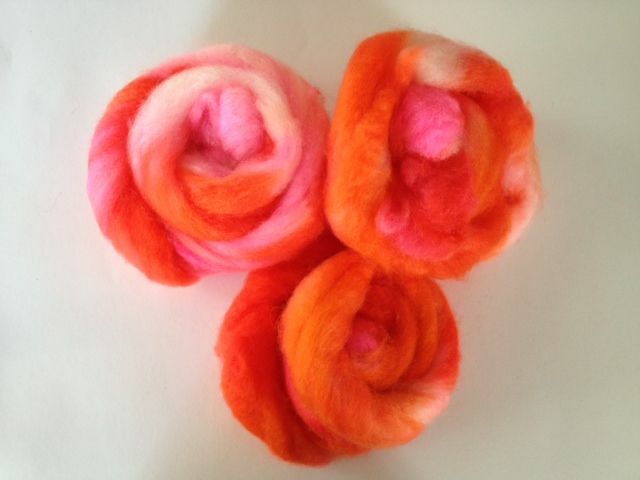 Hand-dyed Roving and Yarn in Etsy Shop 03/17/2013. 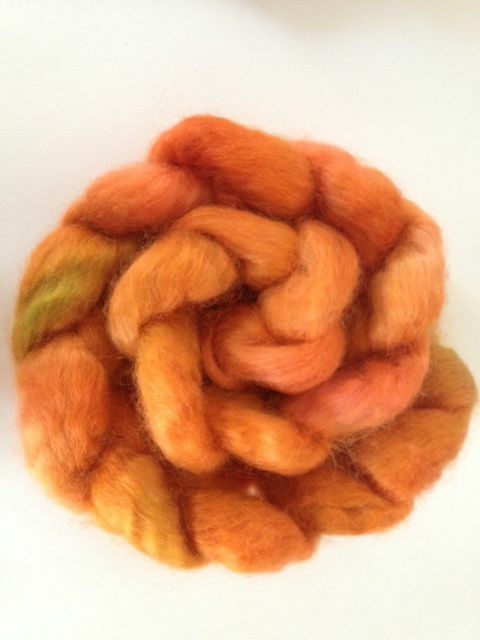 "Pumpkin Patch," hand-dyed Wensleydale. 4 oz. $16 plus shipping SOLD. Batt Buddies. Set of 3. 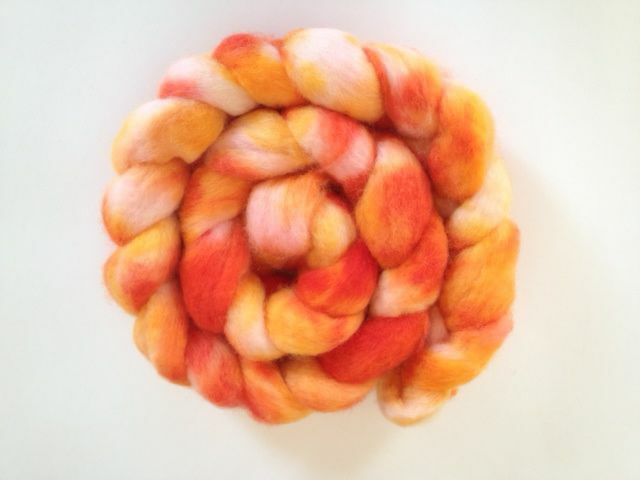 "Neon Nemo," superwash BFL, hand-dyed, 3.1 oz. $12 plus shipping SOLD. 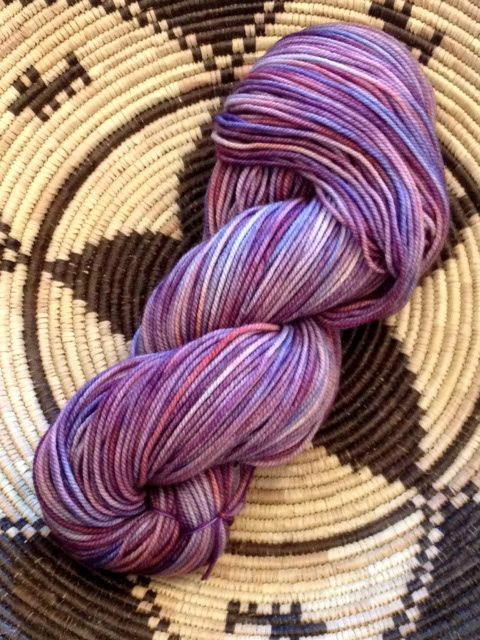 "Santa Fe", Shetland top, hand-dyed. $15 + shipping SOLD. 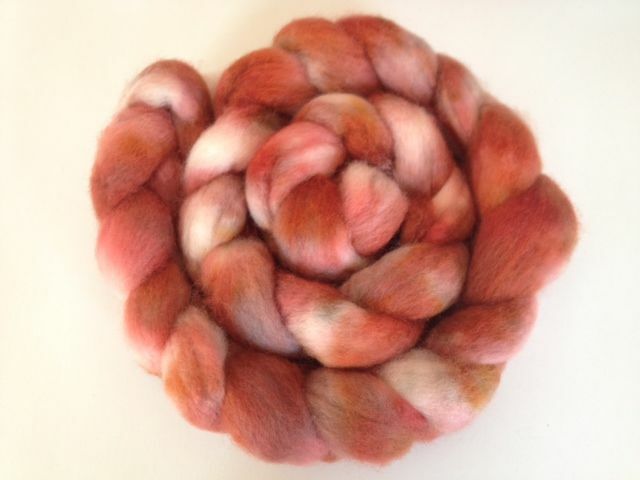 "Coralberry", Shetland top, hand-dyed. 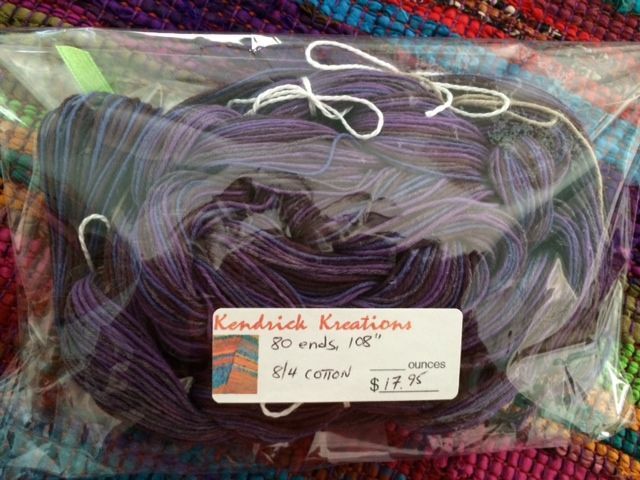 $15 + shipping SOLD. "Intuition", Shetland top, hand-dyed. $15 + shipping SOLD. 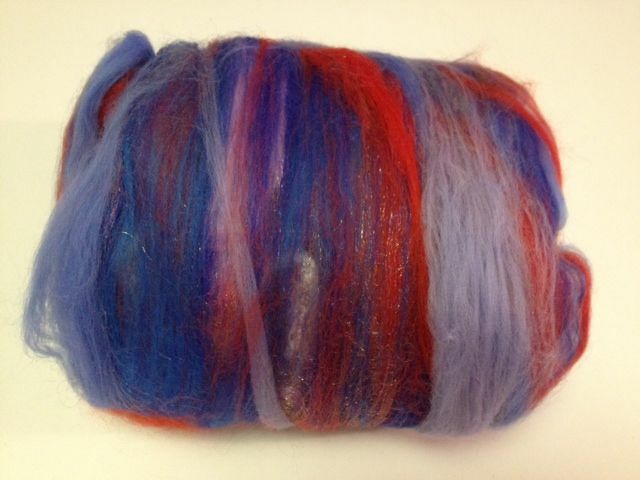 Art batt, "Red Sails in the Sunset" 2.3 oz. 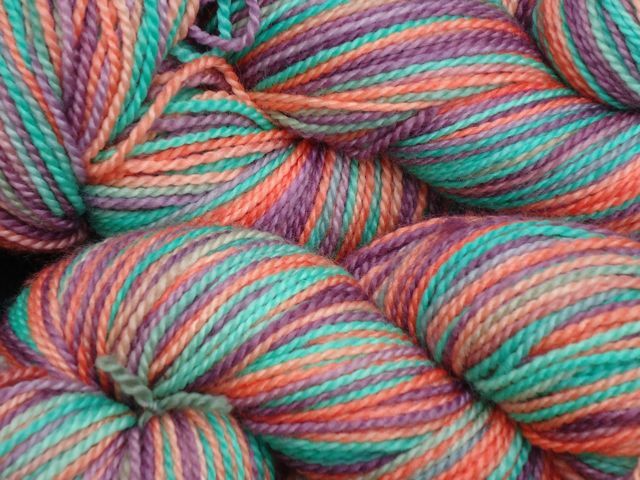 merino, firestar. $13.80 + shipping. SOLD. Art batt, "Lava on Parade" 2.2 oz. 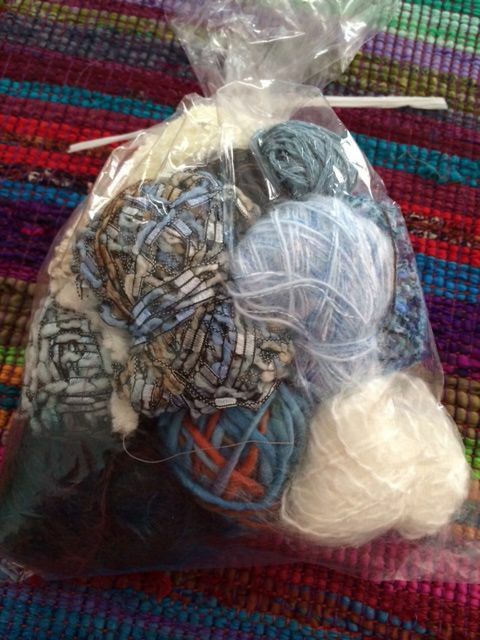 merino, firestar, sari silk waste, wool. $13.20 + shipping. SOLD. 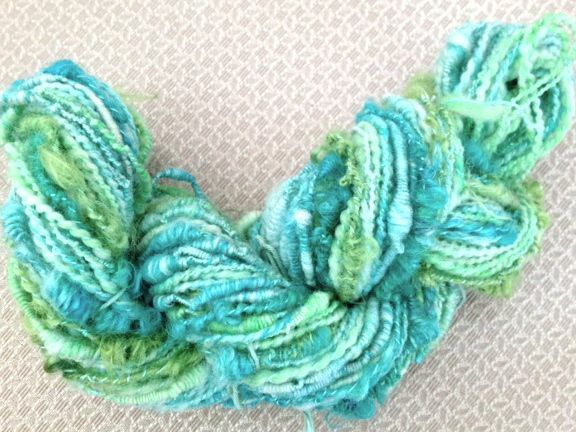 "Hanauma Bay", hand-spun art yarn, merino, mohair, plyed with bamboo, 86 yds., 2.9 oz. $39 + shipping. SOLD. "Blueberry Bonsai", 4.1 oz. 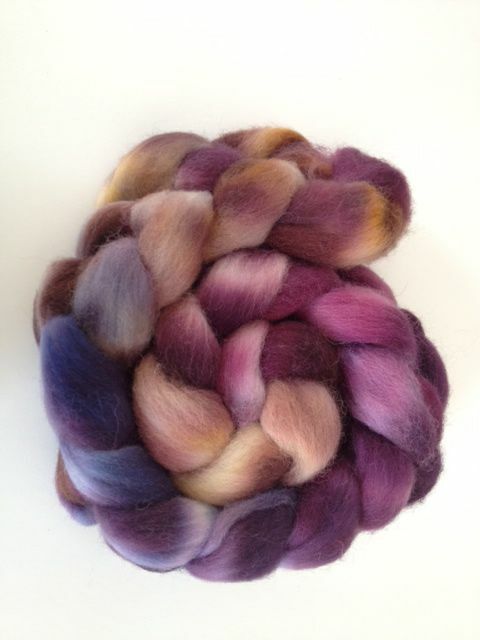 Finn top, hand-dyed. $16 + shipping. SOLD. "Koi" 3.9 oz. 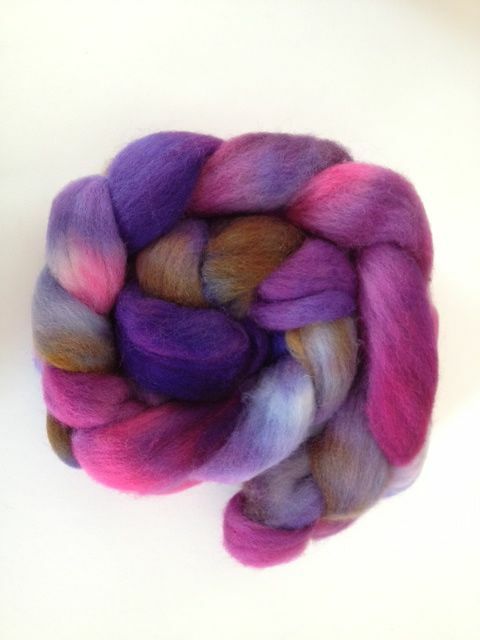 BFL, hand-dyed. ON SALE Reg. $16. Now $14 + shipping. 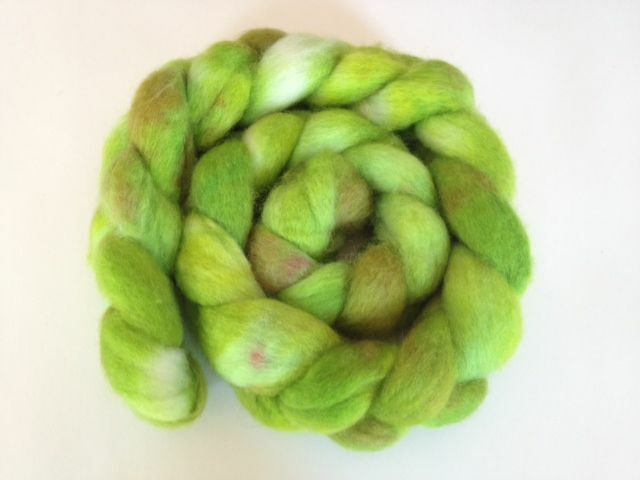 "Granny Smith" 3.8 oz. 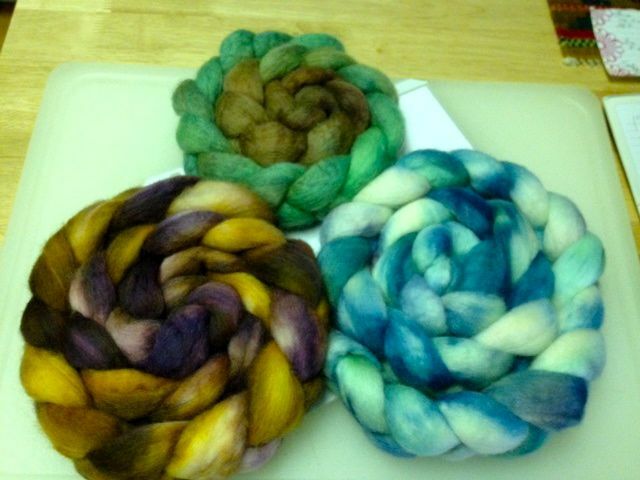 BFL, hand-dyed. ON SALE Reg. $16. Now $14 + shipping. SOLD. 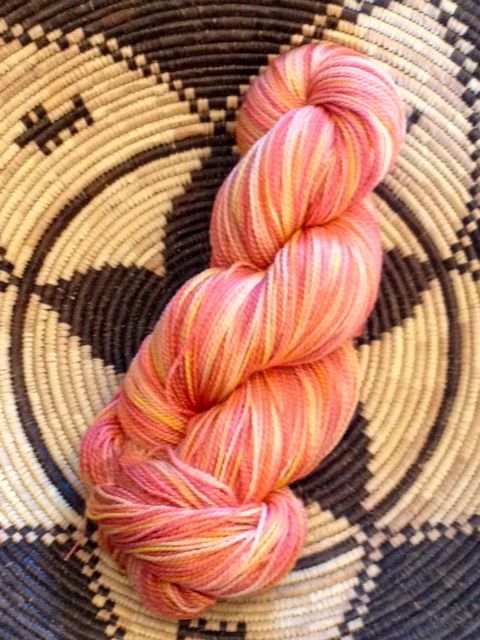 "Sweet Potato" 4 oz. 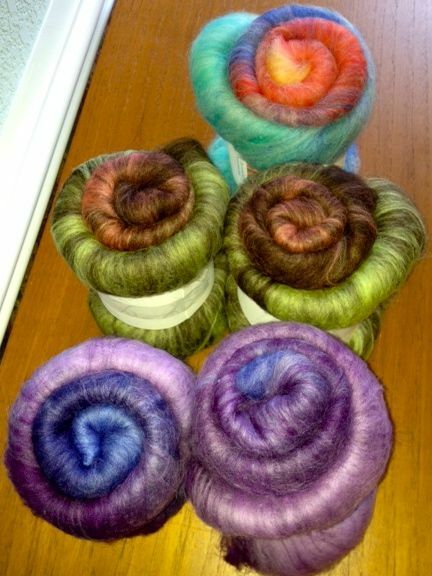 BFL, hand-dyed. ON SALE Reg. $16. Now $14 + shipping SOLD. 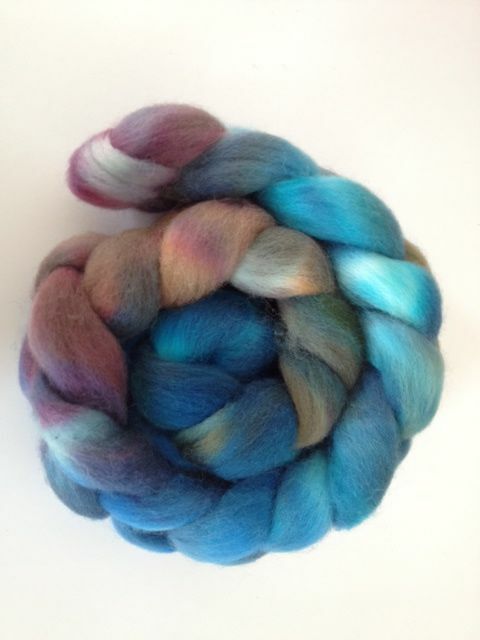 "Abalone" 3.8 oz. 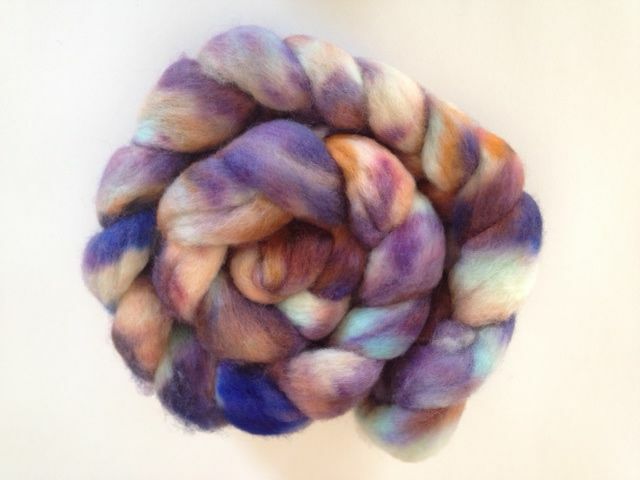 BFL, hand-dyed. ON SALE Reg. $16. Now $14 + shipping SOLD. 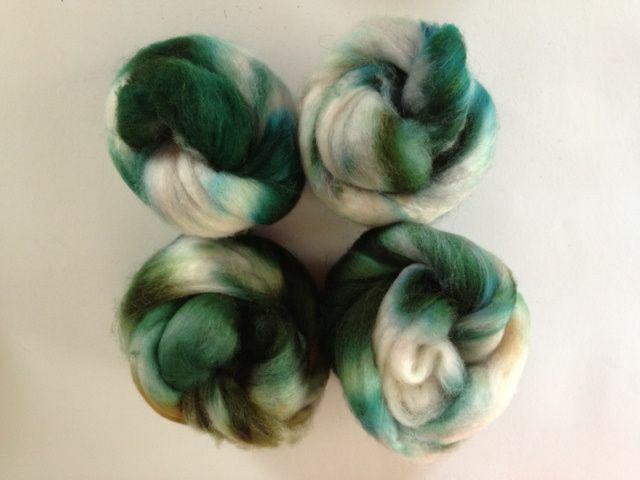 Hand-dyed with eco-friendly dyes, 80/10/10 superwash merino/cashmere/nylon. 250+yds. "Larkspur" $15 plus shipping. 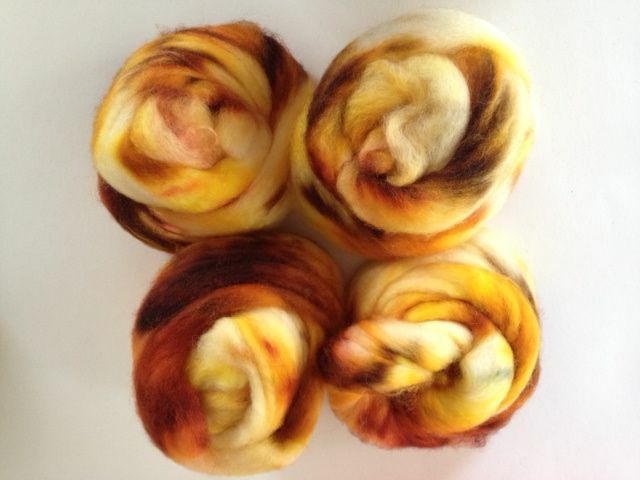 Hand-dyed Finn top. "Mocha Chino" 4 oz. $16 plus shipping SOLD. 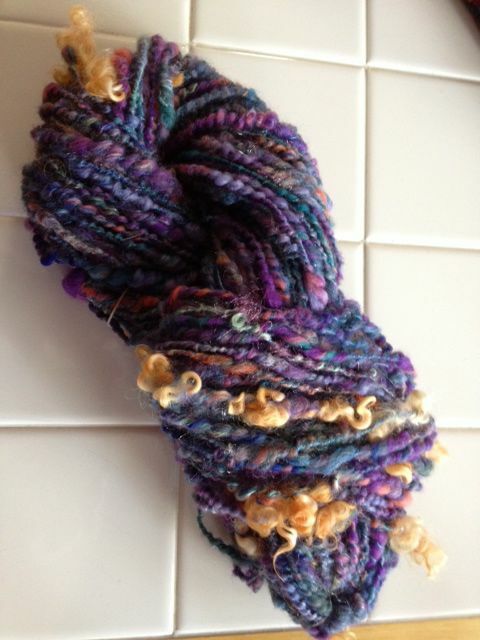 Hand-dyed with eco-friendly dyes, 70/30 superwash wool / sea cell yarn. 375+yds. "Poppies & Cream" $15 plus shipping. 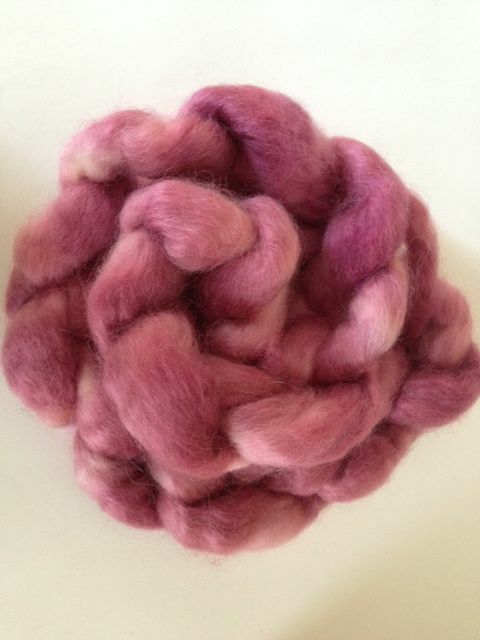 Hand-dyed alpaca roving, by the ounce. 4 ounces available. "Salt Water Taffy" $4/oz. plus shipping. SOLD. 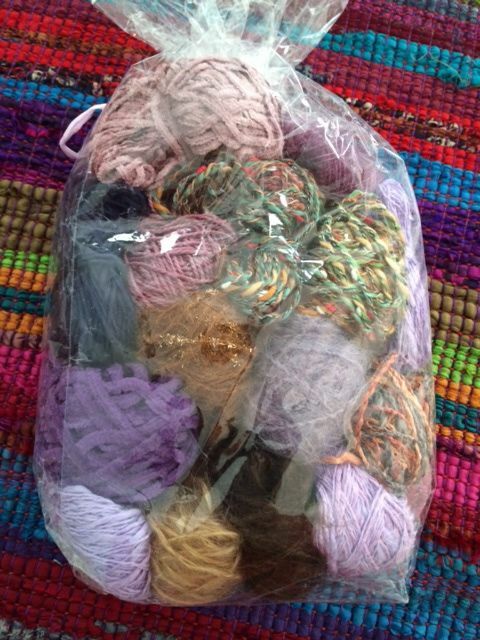 Yarns and Fiber Batts For Sale. 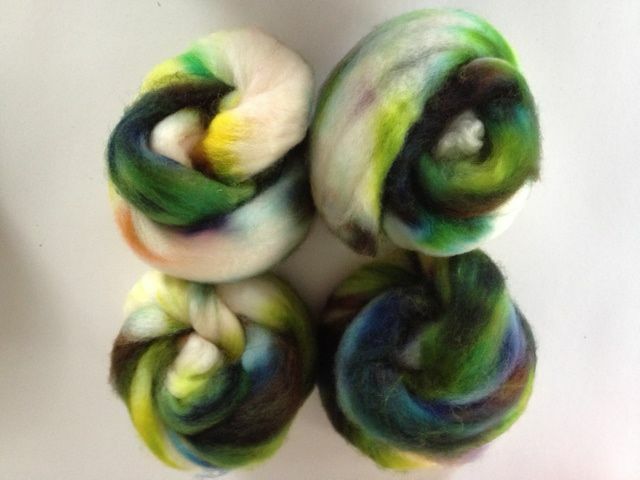 Here are some photos of some previously made batts. If something strikes your fancy, please send me an email. 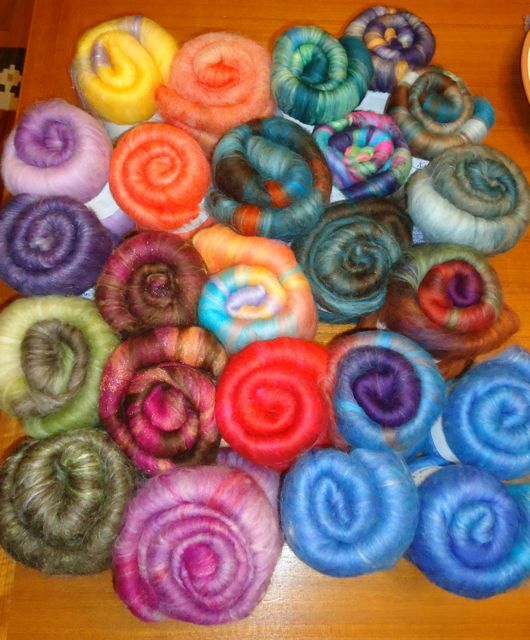 Content varies, from merino, corriedale, silk, soy silk, mohair, mohair locks, pulled silk, firestar, reclaimed silk, silk noil, glitz and more! 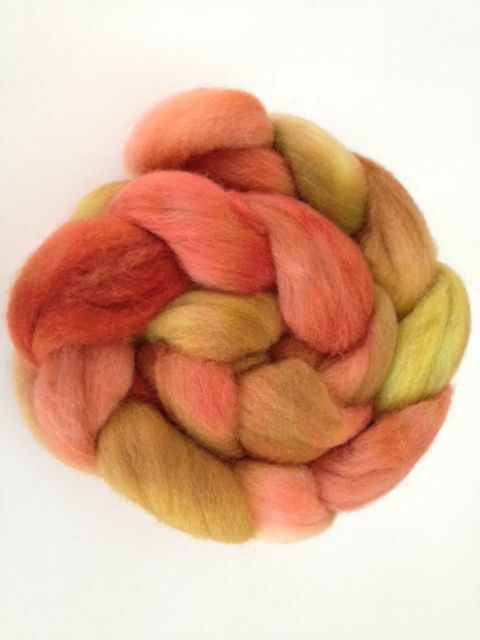 Larger batts available as well (made on the Strauch fine, double-wide, motorized carder. 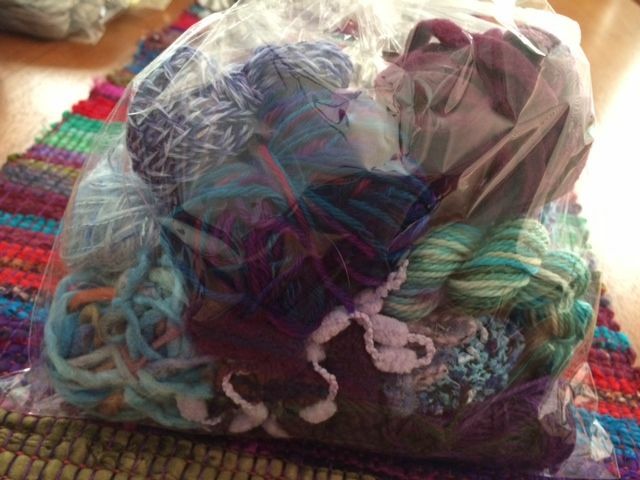 Art yarns for Trunk Show 12/8/12. More items coming soon! Please check back. 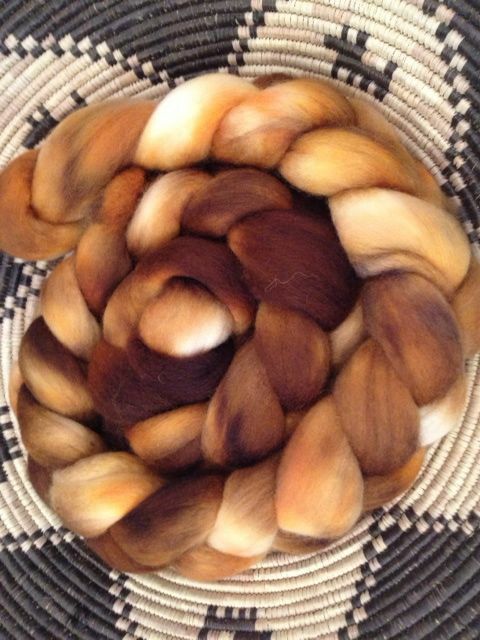 Blended fiber batts for spinning or felting. 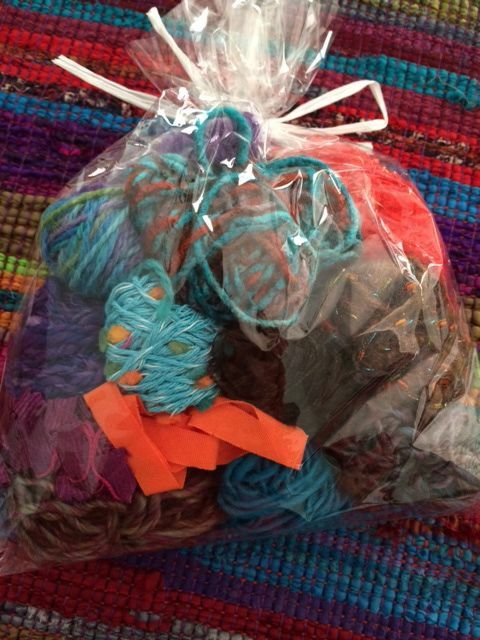 Hand-dyed yarns for weaving and knitting. 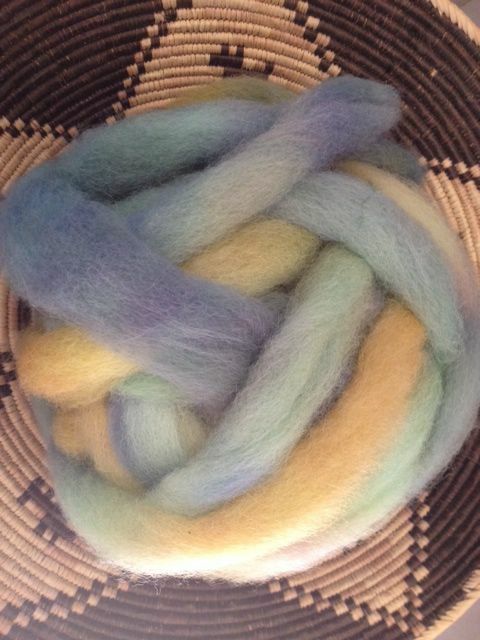 Hand-dyed braided fiber for spinning. $4/oz.